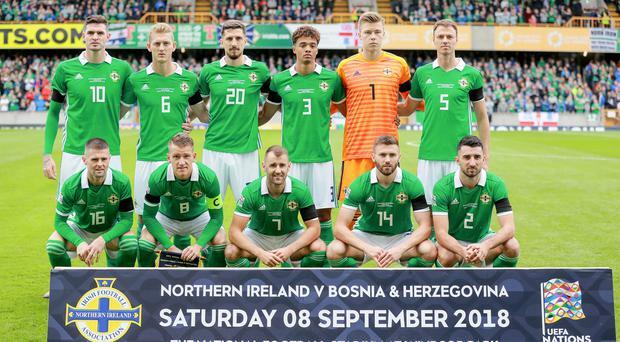 Northern Ireland lost out 2-1 to Bosnia and Herzegovinia despite a dominant display. It was a defeat they didn't deserve for a largely dominant display, but just how did Northern Ireland's individual players fare at Windsor Park on Saturday? Steven Beacom runs his eye over Michael O'Neill's men. Bailey Peacock-Farrell 6: The young goalkeeper was involved in the mix-up that led to Bosnia’s second goal. Otherwise steady in a game where he was rarely called upon. Conor McLaughlin 6: Has become such a reliable performer though may feel he could have closed down Edin Dzeko’s cross for Bosnia’s first goal. Jonny Evans 7: Nothing much flusters Evans in a green shirt these days. With the home side dominating he wasn’t too busy, but still showed his quality. Craig Cathcart 6: Big enough to take responsibility for Bosnia’s match-winning goal. Now a huge player for his country he will quickly move on from that. Jamal Lewis 7: Impressed in the left back slot, showing athleticism and a willingness to attack. The youngster linked up really well with Stuart Dallas. Niall McGinn 7: Created havoc on the right flank in the first half. Was in electric form, skipping past defenders and whipping in crosses. Also unlucky not to score. Northern Ireland's Niall McGinn gets a shot away. Oliver Norwood 6: Experienced and intelligent player whose passing and set-piece deliveries are key to the way O’Neill’s side play. Solid game. Steven Davis 7: Set the tone for the team early on with his pressing and didn’t let go. Class act. Northern Ireland are so much better when Davis plays well. George Saville 7: Continues to shine at international level. Should have had a penalty in the first minute and looked dangerous and lively going forward. Stuart Dallas 8: One of his best matches at the highest level and unfortunate to be on the losing side. Raided down the left flank with intent and could have scored. Northern Ireland's Stuart Dallas in action with Bosnia & Herzegovina's Gojko Clmirot. Kyle Lafferty 7: Brought a fine save from the Bosnia goalkeeper and led the line well. Will play a massive part if Northern Ireland are to reach Euro 2020. Will Grigg (Lafferty, 69 mins) 7: Displayed his scoring prowess with a late goal. Clever at finding space in the box. Will Grigg - 6 - Given the chance to start — his first at Windsor — but unlike the Bosnia game didn’t score or make a big impact. Worked hard in lone front role. Liam Boyce (McLaughlin, 70 mins) 7: Set up his side’s goal, almost netted himself and made an impact. Worth a start versus Israel. Jamie Ward (McGinn, 76 mins) 6: Good to see this tigerish performer back on the pitch. As always was keen to get into this action.